Handcrafted brews from our hands to yours. SERVING HANDCRAFTED BEER FROM OUR HANDS TO YOURS. LOCATED JUST SOUTH OF SOUTH AUSTIN. Sit back, relax, and sip on any of our six brews on tap including large and small batch brews, and brewery-exclusive beers. With events, live music, food trucks, and brewery tours, Two Wheel Brewing is likely to become your favorite brewery just south of south Austin! there is Roll of the Dice Wednesday, the Dice determines which beer is $3, Thursday (all Day) and friday (4-7 pm) we have happy hour which includes $1 off pints & $2 off flights . Keep up to date on new brews, events, live music, food trucks, and giveaways through Facebook and Instagram. Kids and dogs are always welcome! *Please supervise your children at all times. *Please keep dogs on a leash and on patio area only. SOLD EXCLUSIVELY FROM OUR TAPROOM…FOR NOW! 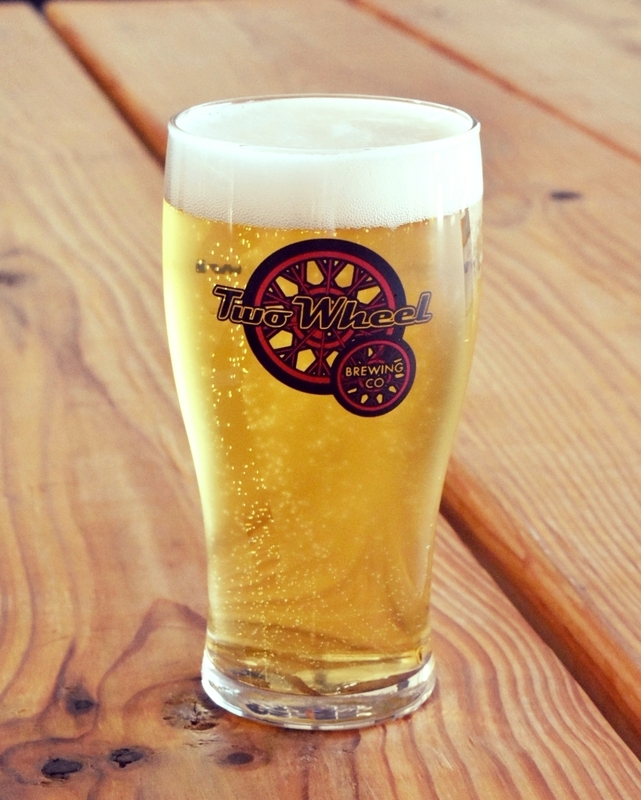 This light, refreshing blonde ale is brewed to be enjoyed on those warm Texas days we all know so well. Pilsner, Vienna, and a touch of crystal malt pair perfectly with Citra hops to make a crisp beer that goes well on its own or with just about any type of food. A portion of every pint sold in the tap room is donated to a local non-profit organization each month. Come by the brewery and try one soon! This is our version of a New England style IPA. It’s hazy just like Race Point on the northern end of Cape Cod. A ton of tropical fruit flavor is packed into this big IPA. Aromas of ripe mangos and pineapple give way to flavors of peaches and apricots. We kept the bitterness low to let the tropical fruit flavors shine through. Race Pointe is available year-round so don’t worry. We won’t run out! Using only whirlpool and dry hop additions of Azacca and Simcoe hops, this citrusy new world ale brings you a little bit of the old and a lot of the new. Simcoe hops provide a touch of the citrus and pine flavors you've come to know and love in classic American Pale Ales and IPAs, while large dry hop additions of Azacca hops bring you an entirely new palate of ripe peach, mango, and sweet pear. We use just enough caramel and Munich malts to create balance without being overly sweet, as well as a clean fermenting American Ale yeast strain so that the beautiful hop flavors and aromas can shine through this crushable spring ale. What do you get when bring in the boys from XLerated Customs and Cycles to brew a batch of beer with you? You get an easy to drink American Lager that is refreshing after a long day’s work in the shop or wherever you put in the hard hours. It’s brewed with Pilsner malt, flaked maize, and Perle hops, so it’s not too bitter and not too sweet. It’s just right! Marc brewed his first beer on a homebrew kit he received as a Christmas present. After the first taste of that simple Stout, he fell in love with creating and drinking beer. He continued to homebrew and read every book about brewing he could find. Next on the agenda was attending a brewing school. Marc studied Intensive Brewing Science and Engineering at American Brewer’s Guild in Middlebury, VT and graduated in July of 2012. After returning to Austin, he began to dream of owning a brewery. He somehow convinced his wife it was a good idea and Two Wheel Brewing Company was born. Thanks Alexis! Email BEN at BEN@twowheelbrewing.com for 1/4 BBL and 1/2 BBL kegs. Similar to most brewers in the industry, Jessie got his start in the wonderful world of brewing with a homebrew kit, and quickly fell in love. Brewing at home wasn't enough though, and after a few years of honing his skills at a local homebrew company, he eagerly stepped into the professional brewing world- working and volunteered at various breweries in the area. He is now thrilled to be a part of the Two Wheel Team, and is eager to serve the craft beer community in the South Austin area. Cheers! Enjoying all the AWESOME art work in the taproom? Or our Menu Skateboards? Callie is the artist behind all the designs. She even designed the art on the Race Pointe IPA 6 Packs.